5xmile today, ran them in 5:43, 5:38, 5:58, 5:52 and 5:45. Felt pretty decent, am battling a head cold and all. Other than that a good day. Went over 1000 miles on the year today! Very casual mileage today, 4.5 in 33:36, or 7:28 per mile. Really tried to keep it around 8, just couldnt do it. Making a conscious effort to slow it up is good though. Got off course, so i had to improvise, even still there is some discrepency on the maps. It says it was only 5.86 or so, I remapped it at 5.94, but I had it mapped out to 6 and then couldnt find a turn it told me too, so who knows if its even right, either way Ill call it 6 in 37:17 or 6:13 per mile. Not a bad workout, was hoping for a tempo around 6:07's, but ill take 6:13, anytime I can get practice running hard for an extended period of time is good. Nice casual 4 in 31:00, or 7:45's today. Took it easy in hopes of revamping my legs. 7, wanted to go 13, but had stomach problems thanks to tailgating all day and chowing not the best of food haha. Ran 7 last night around 9 pm, got up at put up another 7 this morning. since i wanted to go far last night and couldnt, i tried to get 7 miles on tired legs by running them back to back. It worked, i was tired. Pretty decent paced 5.5 today in 38:45, or just faster than 7:03 per mile. Felt good after a SRD yesterday, first 5k in a month this weekend. 13x400 today all either 1:19 or 1:20, for a total time of 17:17, which equalled out to around 5:19 miles. This is my typical race week speed workout. Pretty good pace for my mileage today, 7:00 per mile exactly, finished in 38:31, so just 1 second above perfect 7 min pace. Felt very good besides the humidity and stomach issues, and still toughed out a good run. easy 4 miles today in 29:25, avg of 7:21 per mile. Felt nice and relaxed. Did some injury prevention tonight after the regular core and stretching because i have had the beginnings of shin splints. I think my shoes are getting high mileage. race in two days!! Ran the 5k today in the Sioux Falls Half Marathon. Got 4th out of around 500 people. Kinda sucked cuz I just missed the money! lol (top 3 got cash payouts). Oh well, I ran well and I was happy with it, if I wouldnt have got all alone late in the race, i coulda pushed it and broke 17. 5:25 first mile, that was the only split they had though. Overall, a good day--A season best of 2009! Wow, so definitely was planning on like 5 miles today, turned into 11. I felt really good out there and just kept humming along, before I knew it, I had run 11 miles in 1:20:45 or roughly 7:20 per mile. Definitely shouldnt have run in my old shoes today, but they didnt perform too badly. 3x1600 today, followed by an 800 at the end. Tried consciously to keep it around 6:00 per mile because that is the pace I am shooting for this weekend. Ended up running 5:42, 5:57, and 6:02. I feel like I dialed it in better the last two, the first was too fast for the sake of this workout. The last 800 was in 2:58. Overall a decent workout, but my legs are tired and it was humid. Taking it easy the rest of the week til the race on saturday. Mini-Taper for this weekends 15k. 4 miles today at 7:14 per mile, ended at 28:56. Pretty hot and humid, but the 4 miles felt really easy, wasnt really breathing hard, which is a good sign. pre-race 2. I feel like Im ready to bust a good race tomorrow! Where to start on this one...I lead the race through 8 miles, should have won it, but faded in the last mile and the two guys who had been about 10-20 yards behind me the whole race threw in a surge to beat me. I technically got 3rd, but the winner was a masters and took the masters title, so that made me 2nd overall. Kind of frustrating to start so well and end not so well, still happy with the time, i was sitting pretty through 6 miles (around 36:20). I maintained even 6's through 4. Ended at 58:04 or somewhere thereabouts, so there is a definite drop off. The race was for a great cause though (cancer fundraiser) and so that is the important thing. I did get a really nice plaque made out of a tree and some gift certificates to restaurants in sioux city, so overall not a bad day, just really thought I was gonna win this one. O well, go hawks! 5.5 miles today in 39:13 or just faster than 7:08 per mile pace. Felt really easy and pedestrian, but I was still pretty sore. Will probably do a similar run tomorrow and just add an extra 2 miles. Legs were still really sore today, especially behind my left knee and my left hip (top of IT band). Because this was the case, I took two major corrective actions. 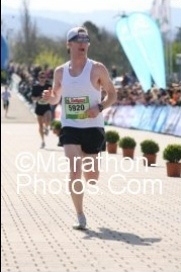 1 being I slowed the pace (finished in 48:16 or around 7:25's, i tried to go even slower than that, but really couldnt). 2 being shortened up the mileage a little. I was gonna go 7.5-8. Another thing I may do if Im still struggling with soreness over the next few days is I may run the 5k this weekend instead of the 10 miler. We'll see. Today was an absolutely amazing, breakthrough workout. I did 16x400 all within 77-79 seconds with 2 at 80. I had equal recovery between each 400, and totaled my time at the end which ended at 4 miles in 20:57 or 5:14 pace! Now granted I had breaks between each of those so its not like I ran a 20:57, but the principal here is that I maintained throughout and had a very uptempo workout. In fact, my times go faster throughout. The first "mile" was 5:18, then it went 5:15, 5:13 and 5:11 respectively. Thus, I pushed throughout the workout. I am definitely running the 5k this weekend instead of the 10 miler. Wanna see what I can get and hope that this workout is a good indicator of a great 5k this weekend, maybe even a PR! 4 easy today. Ran 29:25 which I think is the exact same time I ran for my "two day out pre race 4 mile run last week". I love pace and the crazy nuances of it. that averages to 7:21 per mile. Felt nice and easy and comfortable. Shooting for sub 17 this weekend. Today I finally got back below 17 minutes! The weather was perfect this morning, a breezy 50 degrees at the start and clear skies. Started out in a 5:17, felt really easy though, i thought for sure I'd be around 5:45 or so, but sure enough I hit that first mile right where I needed to be. Second mile was 5:46, as I came through in 11:03. I have some doubt as to the accuracy of this second mile marker though. I think it was long, because I closed the last 1800 meters in 5:50, which means I ran a 5:10-5:14 third mile. Although I did pick it up, I dont know if I had picked it up that much. Regardless, I crossed in 16:53, my third fastest time ever and this year's season best. When I first saw the finish line, I thought for sure I was going to PR because the clock was at 16:12 and I had about three blocks to go. Turns out, those were a long three blocks as I didnt quite get the PR. Nonetheless I am super happy with this run. Now it is time to focus my attention towards the Sioux City Half Marathon on October 17--My goal race for the fall. Overall, I kept it pretty steady. I noticed that while you can definitely tell my uphills, i had significant downhills on mile 1 and 9 and those were still evenly paced. Overall a good run. finished with 8x50 meter strides. Overall, an okay run in windy conditions, just felt very stiff. finished with 6x50 meter strides.